A leisurely start to 2018 has given us an opportunity to do some thinking and planning. We have started thinking about our professional development for the coming year. In this post, we share a calendar of 2018 conferences that offer a focus on foundation and LLN skills. Our ideas have come from members of our network – colleagues, clients, and social media contacts. Their suggestions have helped us shape our thoughts about what we can do to learn more about building foundation skills, and to remain effective and current with our foundation skills practice. We hope you find them helpful, also. It is not our intention to promote any particular conference over another – we have simply passed on details of those conferences that were recommended to us and will let you make your own decisions about the best conference choice/s for you. We hope you will use the comments box to contribute to this discussion – comment on the conferences suggested here, and/or add more conference suggestions. numerous workshops and other professional development events to help us enhance our foundation skills expertise. To manage the amount of information provided in this post, our calendar lists only the 2018 conferences that we are aware of. We have not listed workshops or any other PD events. Visit the website of the adult literacy organisation in your state to learn more about conferences and other PD events they will offer this year. These events provide great opportunities to share ideas and build relationships with other foundation skills practitioners in your state. Tip: Visit your state literacy organisation’s website numerous times throughout 2018 – most will continuously list new PD opportunities as the year progresses. One respondent suggested events run by the Australian Council of Social Service (ACOSS) and its state-based affiliates. Their point was that often, the people we support with foundation skill needs, have other social needs, as well. ACOSS events could offer useful professional development if we want to learn more about how to address an individual’s social needs. Skills and knowledge we learn may supplement our existing expertise in foundation skills, and help us build the ‘whole person’ through the foundation skill support we provide. We had a look at the ACOSS website. At the time of writing this post, we could not find any information about ACOSS’s 2018 national conference, but information about their 2017 national conference (held in late October), remains on their site. The theme of this year’s one-day Research and Practice in Adult Literacies (RaPAL)’s conference is Collaboration and Connections. RaPAL’s 2018 conference page has comprehensive conference information. With 350 breakout sessions available to its 2000+ delegates, the Coalition on Adult Basic Education (COABE)’s 2018 conference looks like it’ll have something for every adult educator. Early bird registration ends on 14 Feb 2018. After that, conference fees will go up. Check out the COABE Conference 2018 site for more information. The Western Australian Adult Literacy Council (WAALC) will host its 2018 conference in Perth, on 16 April. The theme this year is Purely Practical – Sharing What works. Presentations may cover writing, pronunciation, reading, maths, engagement in learning – yet to be finalised. Go to the WAALC 2018 Conference page for more information. The Victorian Adult Literacy and Basic Education Council (VALBEC) will hold its conference in May. The exact date has not yet been announced. Stay tuned to the VALBEC website for details. European Basic Skills Network (EBSN)’s annual conference will take place in Berlin. The conference program is not yet available, but information on the EBSN conference page suggests that it will be posted soon. The Tasmanian Council for Adult Literacy (TCAL) annual conference will take place in Glenorchy. The conference program is not yet available, information will be posted in due course. If you have a particular interest in numeracy and maths, Adults Learning Mathematics (ALM)’s 2018 conference may be your ideal choice. London will be beautiful in July! The conference theme is Boundaries and Bridges: adults learning mathematics in a fractured world. See the ALM25 conference site for more information. The NCVER ‘No Frills’ is traditionally a July calendar event. However, this year, ‘No Frills’ will be co-hosted with New Zealand partners, the Industry Training Federation and Ako Aotearoa. ‘No Frills’ offers researchers and practitioners in the vocational education and training (VET) sector opportunities to present, discuss and share information about sector key issues. Exchanging research and knowledge with NZ partners broadens and highlights best practice considerations. The 2018 conference program will focus on Skills for a global future: working and learning together. Click here for more information. The Australian Council for Adult Literacy (ACAL) will hold its annual conference for 2018 in September. This year’s conference theme is, Learning in Diverse Communities: strengths, reflections, questions. foundation skill specialists who want to network with peers and share ideas. Visit the ACAL 2018 Conference page for more information. Always well attended and well run, Velg Training‘s National VET Conference (NVC) is the major event for VET practitioners in Australia. NVC2018 will be in Adelaide. The 2018 conference them is Skilling Australia’s VET Future. NVC 2018 will feature breakout sessions that fall into a range of themes, including a foundation skills theme. If you’re a vocational practitioner wanting to update or extend your expertise in building learners’ foundation skills through vocational training, NVC2018 may be just for you. The Velg Training NVC site has details. The Australian Council of TESOL Associations (ACTA) will hold its annual conference this month. Its theme is to Establish language learning in a mobile world. This conference will feature six strands (focus areas) for sessions, including mobile learning, teaching and assessment. For more information, visit the ACTA 2018 conference page. In December we will again look back to look forward. We will look back on all things learned in 2018 and look forward to another 12 months of learning. Our thanks to those who contributed to this post. 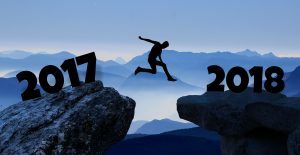 Happy 2018, happy learning! What a plethora of choice and reservoir of pertinent LLN Foundations Skills information. Thank you Anne and Chemene for a great blog.